Here in the North Eastern corner of the United States the leaves are starting to change colour and are slowing falling from their branches. Evenings are getting a bit chilly, which for many of us signals the time to reach for our cozy yarn and decide what to knit for the colder months ahead. A lovely shaped Halter Top is worked back and forth in short rows and around a hair-pin loop shaped cast on. There are photos included in this pattern to help you learn the hair-pin loop cast on, plus an option to incorporate bust darts are included and can be added according to cup size. I particularly like the button-up back. This top looks great over a crisp, white shirt, or could be worn over a T-shirt, or if you like showing off some skin, well, you know where I’m going, right? Knitted using 2 skeins Madelinetosh Tosh Merino Light in shade Candlewick as the main colour, and I would recommend a skein each of shades El Greco, Odessey, and Moonstone as the three contrast colours, or just choose one contrast colour, as yardage will allow for it. You will also need 1 40-inch US #5/3.75mm circular needle, plus another needle of same or smaller diameter to hold stitches while grafting. 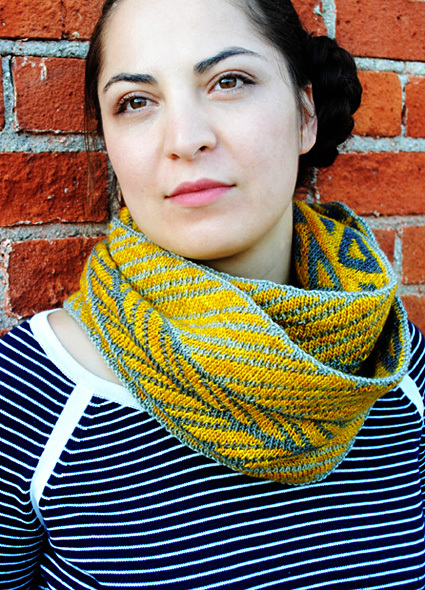 I love cowls and this one’s a beauty! If you haven’t tried stranded knitting before, this would be a great project to introduce you to the technique. 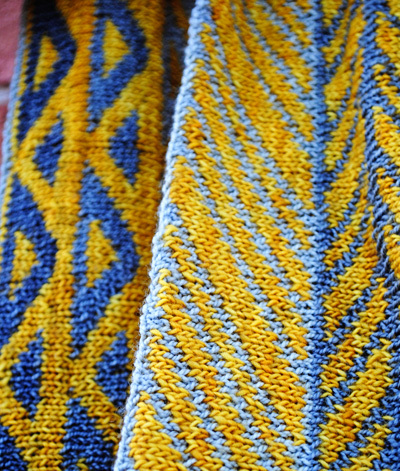 Included in the pattern are links to working the backwards loop method as a provisional cast on, stranded colourwork, (Fair Isle), and grafting. Also included are links to the charts used in this pattern, as well as more beautiful photographs. 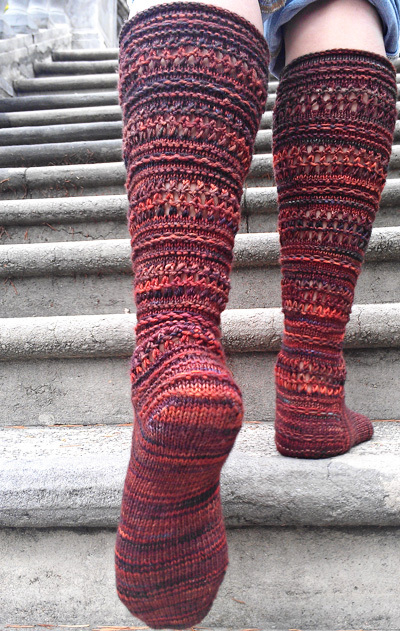 There’s nothing quite like the feeling of wearing handknit socks! 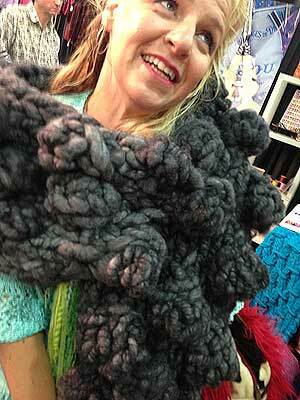 They are such a great, portable project to have with you when you’re out and about. You can whip them out and work a few stitches almost anywhere! 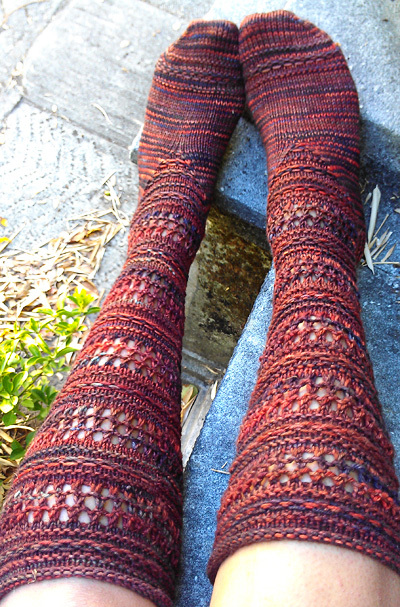 I particularly like the use of textured lace stitches in these socks, it helps show off this beautiful, variegated yarn very well. I also like the long length and the designer’s innovative way of incorporating the heel shaping on the top of the foot. 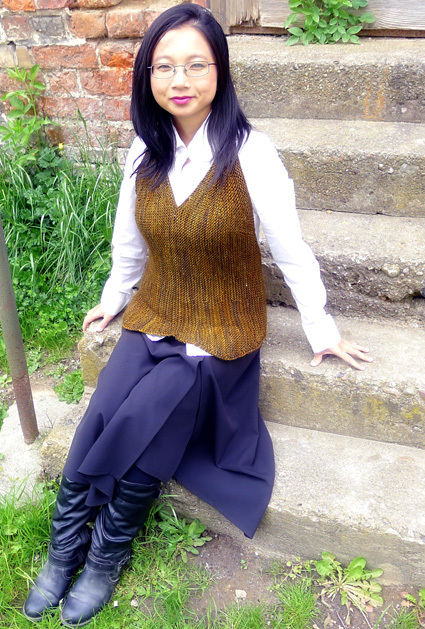 There are lots more patterns to drool over as well as wonderful articles and technical information to read on the Knitty website. It is a great resource for knitters all over the world, so grab yourself a beverage, get comfy and settle in for a feast for your eyes. Previous story What is Heather Knitting NOW?